After a couple of years of searching for a great deal on HermanMiller Aeron chairs, my wife finally found one, and we’ve been enjoying them for the past 8 months. Unfortunately, her chair developed a crack in the back (most likely due to mis-assembly by the store.) I feared an expensive repair, but started searching for parts anyway. I came across the website ChairMD.com and found out that it might be possible to have the back replaced under warranty. All HermanMiller chairs are covered by a 12-year warranty. So I filled-out the warranty request form on their site. They provided a diagram chair so that I could clearly identify the failed part and I also entered all of the chair configuration and serial number details from the sticker on the bottom of the chair. 4 weeks later, a replacement chair back arrived via FedEx. I’m elated. Instead of an expensive repair, I received a nearly effortless warranty replacement. Thank you Chair MD. I similarly had a wonderful repair experience with ChairMD. My chair was over 8 years old. Luckily, my chair was purchased through an authorized dealer by my current employer. After ChairMD submitted a warranty claim to the manufacture for my broken cylinder, they sent me a shipping box and a FedEx shipping label. The chair was repaired and back in the office before I knew it! Great service! Wow that’s great. We also use HermanMiller Aeron chairs at work… I am thinking, I should get one also for personal use. Thank you for sharing your great experience. Best regards,Raphael Nikolai – Out of Warranty Author.. 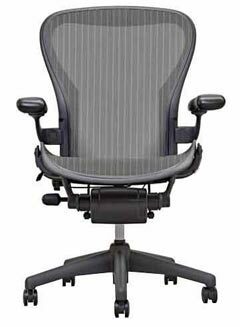 I have an aeron chair – not sure of the age – but maybe 10 years old or so – that was given me by my company when i left – I actually purchased the chairs for my office – everyone had one – and i got to keep mine. It’s been over 7 years since i’ve had it at home – and it has lost its lift. It is now sitting too low to use. Can you help? The 12 year Herman Miller warranty is like none other. I always suggest to clients that they look at Aeron or other HM chairs just for that reason!